Forum supports Special Olympics Illinois and their mission to provide opportunities for children and adults with intellectual disabilities to develop physical fitness, demonstrate courage and experience joy. Forum Partner Mary Anne Ehlert is an advocate for the special-needs community and serves on the board of Special Olympics Illinois. We asked Mary Anne to share her personal story. I grew up with Special Olympics Illinois. My sister Marcia was an athlete, and I was often her sidekick. My younger sister was born with cerebral palsy, which affected her both physically and developmentally. However, it did not limit her ability to have a full life, and Special Olympics Illinois was a big part of that. She competed in the wheelchair racing competition and bowling. Those programs gave her not only self-esteem, but also friends, a social life, a bigger purpose and MEDALS! I learned firsthand what a difference it made in her life. As I got older, I was given the opportunity to volunteer in many ways at the games. Now, I participate on the Board of Directors, side by side with other professionals as well as with the Special Olympics athletes on the Board. I’m sure I have learned more from them than they have learned from me! Being able to share your talent with a not-for-profit that makes a difference in so many lives has been a true motivator for me. Special Olympics Illinois is much more than athletic competition. It teaches athletes to have friends, deal with differences, socialize in our world of complexity and give of their own time and talents. Over the years, the Young Athletes program has enabled younger children to participate and give them an avenue for full participation in life. Today, the Unified Sports program gives ALL athletes the opportunity to compete side by side. In 2018, Special Olympics will be celebrating its 50th anniversary. It started here in Chicago, so we will celebrate here in Chicago with the culmination of events over the weekend of July 20. Athletes from all over the world will participate, as well as their many family members. The team I know as Special Olympics Illinois looks forward with great excitement at the next 50 years. I personally serve on the 50th Inclusive Cities Committee, where our goal is to make the city of Chicago truly inclusive for individuals with intellectual disabilities. With that template created, we will take this initiative to other cities where competitions are held. Inclusivity means opportunities in employment, financial security, appropriate places to live, supportive transportation systems and quality health care. This means our governments, corporations, hospitals and private corporations all working together to provide opportunities that work for those with intellectual disabilities. I have been honored to be involved with Special Olympics Illinois. If we thought the last 50 years were exciting and life changing for many, I can’t wait to see what we can do in the next 50!! 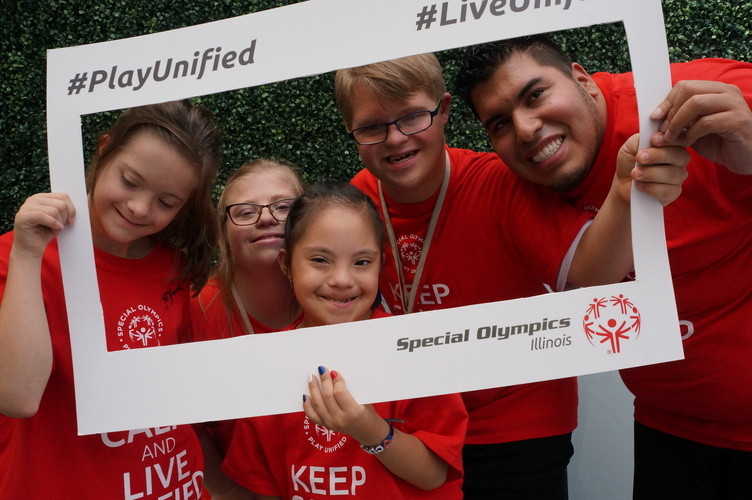 Special Olympics Illinois is dedicated to changing the lives of people with intellectual disabilities by addressing the global injustice, isolation, intolerance and inactivity they face. Through statewide programming, Special Olympics Illinois provides opportunities for more than 20,000 athletes with the help of thousands of volunteers throughout Illinois. For more information, visit soill.org.